Death Cab For Cutie Shares “Black Sun” Video, Expands Tour. 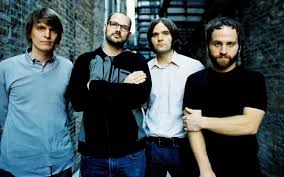 Indie pop stalwarts Death Cab For Cutie have had a busy couple of weeks as they prepare for the release of the eighth studio album Kintsugi on March 31. The Bellingham, Washington outfit have already shared the first single from the album “Black Sun,” and recently performed it live on Late Night With David Letterman. Now comes the official video for the track which stars the living and breathing Ben Gibbard himself. What’s more, the group has expanded their already lengthy world tour with more U.S. dates, support will be provided by The Antlers, Explosions In The Sky, Built To Spill, and everyone’s favorite band to type-out, tUnE-yArDs. A glaring hole remains between the Mesa, Arizona show on April 10 and the Kansas City, Missouri show on April 23, leaving open the possibility of a Coachella late-add. The band would fit perfect on the Sunday schedule that’s already EMO friendly. If you’re interested, here are the actual tour dates. The band is moving forward without guitarist Chris Walla, who recently departed after 17 years with the band. However, the band confirmed that Mr. Walla was involved in every way with the making of the new album Kintsugi.